IBPS PO 2019 Notification: Any graduate candidates, who aspire to join the Banking Sector as a Probationary Officer/ Management Trainee or in a similar post in that care is required to register for the Common Recruitment Process CWE PO/ MT- IX. The Institutes of Banking Personnel Selection is ready to conduct the Probationary Officer or Management Trainee-IX Examination in the online mode. The IBPS has published the IBPS PO 2019 Notification Pdf on the official website to recruits the candidates for the vacant posts for 20 public sector banks. The IBPS PO MT Recruitment 2019 Online Application process will be started from August to September 2019. Scroll down the page and check the Eligibility, Exam Date, Selection Process and more details. The Institutes of Banking Personnel Selection has released the PO Recruitment 2019 notification to fill the various vacant posts. The IBPS has released the official notification for the PO/ MT-IX Exam in August 2019 on their official portal. The IBPS is conducting the PO/ MT Examination for the 20 Public Banks. Applicants have good news who wants Government Jobs in the banking sector. 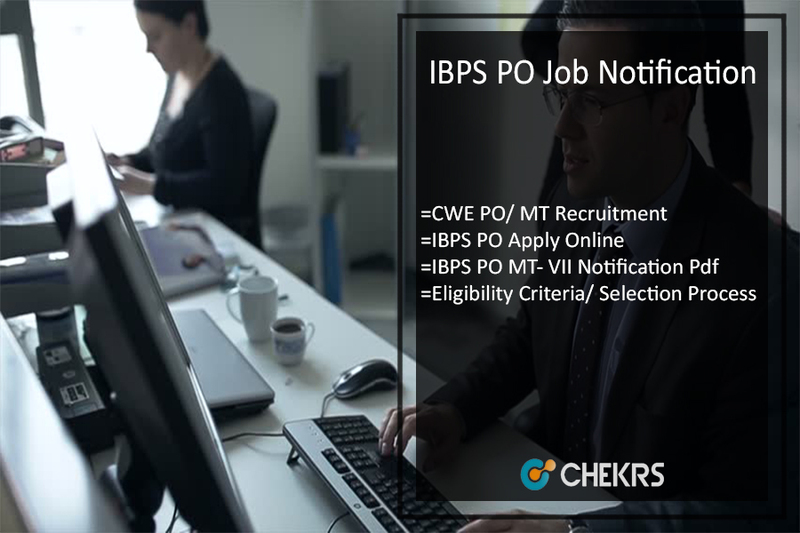 You can check the post Details such as Post number, Pay Scale, Application Process of IBPS PO MT Vacancies from here. The IBPS PO MT Online Application will be started from August to September 2019 on the official website. Applicants are invited for IBPS PO Application Process in the online mode and should complete this process on or before the lasted date. After completing the application process, the IBPS will generate the IBPS PO/ MT Exam Admit Card for the IBPS PO MT Exam. The exam will be started from October 2019. Uploads the photo and signature in the prescribed format. Before submitting the application fee preview the application form. Candidates must consist Graduation Degree in any discipline from a University recognized by the Govt. Of India or any equivalent qualification recognized as such by the Central Government. The participated applicant’s minimum age must be 20 years and maximum age must be 30 years. Keep visiting our site www.jobs.chekrs.com. In case of any query or review in regards to Latest IBPS PO 2019 Notification, Exam Date, Selection Process etc. You can also place your valuable comments in the commenting section below. We will revert you in a short while. many years.And last 10 years I,m not eligible fr this.why a persn who is more than 30 cann,t do this job. Age limit should applicable on polticians and actors also. Every department/ Organization Like Government/ Semi government and Private who are releases jobs notification, they fix their criteria. and IBPS Age Limitation is 30 Years. It’s IBPS Norms & policies.